Real stone and natural aggregates. Ideal for O-Scale. Also available in 1/2-gallon size (SE0476). (Old alternate # SS1100-3). Real stone and natural limestone aggregates. Ideal for O-Scale. Also available in 1/2-gallon size (SE0486). (Old alternate # SS1200-3). Real stone and natural aggregates. Ideal for O-Scale. Also available in 1/2-gallon size (SE0496). FINE NATURAL SOIL/DIRT - Approx. 3/4 cup. Fine-sifted - Powder-like. Ideal with Prairie Tufts & Pathways. Medium Natural Soil & Dirt - 3/4 cup multi-purpose sifted soil and sand for dirt roads. Medium Natural Soil & Dirt - 32oz. Quart - Medium sifted soil & sand. Multi-purpose for dirt roads. 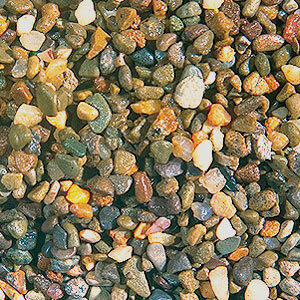 Unscreened River Rock - The best looking we offer! Suitable for all scales. Real stone and natural river rock debris. 32 oz. quart. Also available in 1/2-gallon size (SE0436). Suitable for O-Scale. Real river rock. Average stone size 3/8-inch dia. Also available in 1/2-gallon size (SE0446). This item is equivalent to the old SS3103-3 number. Gray Gravel Coarse - Gravel is sized to model gravel roads more realistically. Use Accent for shoulders and to model bare spots on roads. Click image for more details. 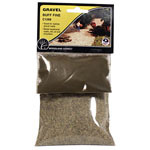 Buff Gravel Fine - Gravel is sized to model gravel roads more realistically. Use Accent for shoulders and to model bare spots on roads. Click image for more details. Buff Coarse Gravel - Gravel is sized to model gravel roads more realistically. Use Accent for shoulders and to model bare spots on roads. Click image for more details. Slack Coal - Our finest grade coal. Ideal for smaller scales. 32oz. Shaker Bottle with spoon or pour cap! Soft bituminous natural aggregate.